The transitional style of this arm chair is a fashionable way to update the seating around your dining table. 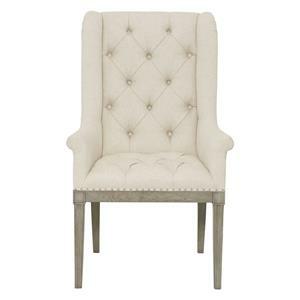 Its low track arms and upholstered seat bring a modern touch to its classic design. The Interiors - Slope Transitional Arm Chair with Low Track Arms by Bernhardt at Thornton Furniture in the Bowling Green, Alvaton, Glasgow, Scottsville, Franklin area. Product availability may vary. Contact us for the most current availability on this product. Browse other items in the Interiors - Slope collection from Thornton Furniture in the Bowling Green, Alvaton, Glasgow, Scottsville, Franklin area.